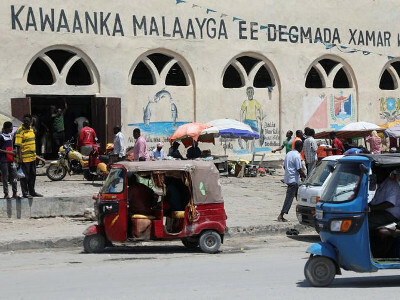 The United States’ diplomatic mission in Somalia directed all non-essential staff to leave Mogadishu, saying it received a “specific threat” against employees. The move came a day after Washington carried out its first air strikes against Islamic State militants in the country, in raids it said killed “several terrorists”. “Due to specific threat information against US personnel on Mogadishu International Airport, the US Mission to Somalia has directed non-essential US citizen employees to depart Mogadishu until further notice,” said a statement. Islamic State has been gathering recruits in the region, but remains a small player compared to the al Shabaab group. Last month, a group loyal to Islamic State seized a small port town in Somalia’s semi-autonomous Puntland region. Al Shabaab is linked to Islamic State’s rival al Qaeda and once controlled much of Somalia. The group aims to drive out international peacekeepers, topple Somalia’s Western-backed government and impose its strict version of Islam on the Horn of Africa state. The United States has occasionally carried out strikes against al Shabaab. More than 350 people were killed in twin bombings in Mogadishu last month blamed on the group.